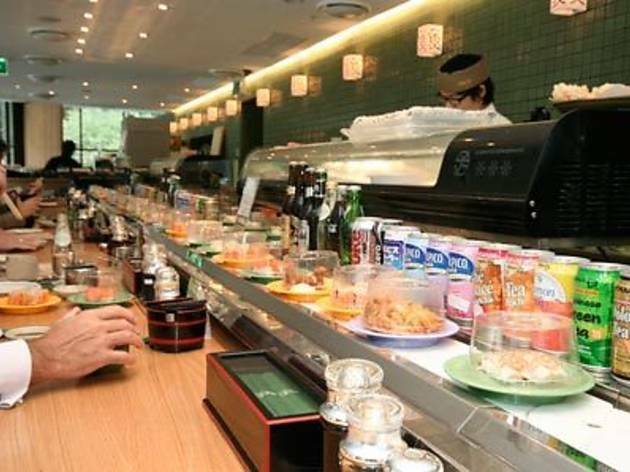 Built right under the ANZ bank on Elizabeth Street in the CBD, this minimalist Japanese restaurant features a speedy sushi train in the middle: a canny use of space and time if you haven't got much of either. If you do have the chance for a longer lunch, the gyoza are a standout - plump little dumplings with gossamer-thin skins, very lightly fried, and a world away from those deep-frier dunked or bottom-fried-to-buggery pucks you see around town. These ones are perfect dipped in a little rice vinegar. Also above the ordinary are the edamame which are hot, salty and still have the fronds attached (unlike the ones you often see which come in bulk bags and have all the taste of a piece of wet paper). However, the mixed tempura isn't quite as exciting: more of a hodge podge of carrot, sweet potato, squid and prawn. The vegetables would have benefited from being sliced a little thinner but no biggie. Drinks-wise, you have to try the ramune. It must be the most fascinating fizzy drink you can buy in Sydney and tastes kind of like lemonade-flavoured bubble gum. It comes with a little gadget that looks faintly like an air bed applicator. The bottle itself is glass with a depression on the sides of the neck, as if someone had squeezed it really hard while the glass was still soft. And inside the depression rolls a clear glass marble, which is where the plastic applicator comes in to play. You use this to press down on the lid (you need a good strong arm for this bit) which then pops the glass marble into the drink. Wacky. Not sure exactly what the marble's for, exactly (aerating the liquid inside? Releasing the awesome power of marble, maybe?) but it certainly makes the whole meal more fun. Happily, they also have ice cream sandwiches which make up for the dull tempura. The fish shaped ones with the guts of red bean are a Time Out favourite but sadly they're sold out when we visit. Instead they've got ones that look like a giant waffle sandwich filled with vanilla icecream. 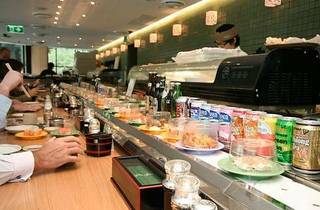 Sushi Tei aren't exactly reinventing Japanese food but they do the basics well, they're great value for money and you can be in and out within half an hour if necessary.